I love an “all in one pan” type dinner. 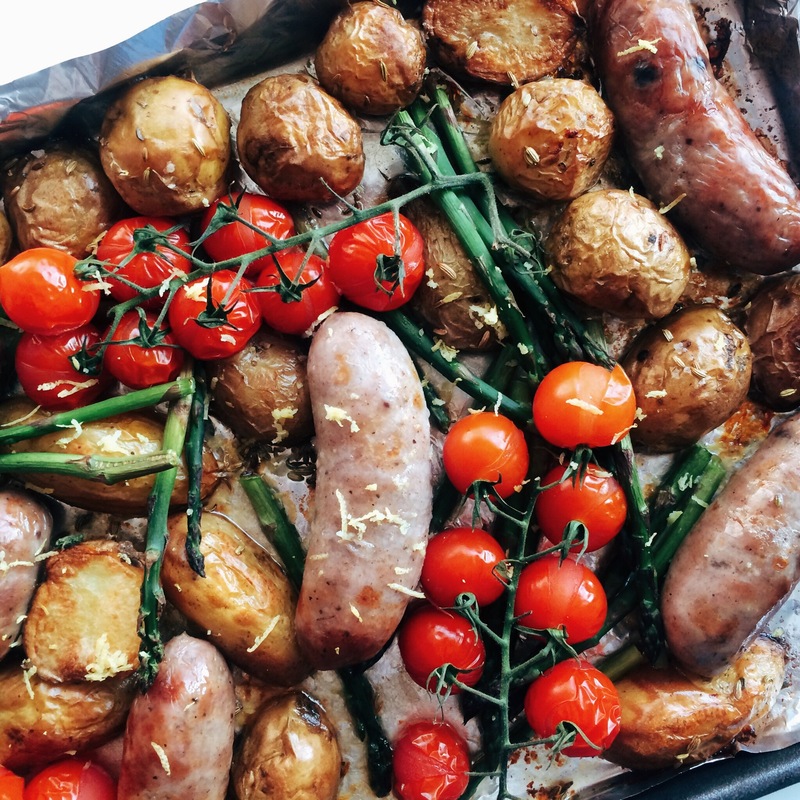 Here the combination of the crispy roast potatoes with the juicy sausages is a winner. I make this type of meal often. I love how easy they are to prepare and the fact I can add and adapt as I go along. I always start with a base of root veg, potatoes, maybe some onions. Once they have softened it’s time for the meat or chicken. Some quicker cooking green veg, tomatoes, chickpeas etc will go in towards the end, more often than not with some feta cheese, and I will finish with a sprinkle of fresh herbs or, as in this case, a little lemon zest. You can use any type of sausages for this. They were selling some amazing pork and black pudding sausages at the farm shop so I went with those but some Italian style sausages would be particularly good here. Preheat oven to 180°c (160°c fan) gas mark 4. Place the new potatoes into a large, foil lined tray (halved if particulary large, otherwise kept whole). Drizzle over olive oil, a sprinkle of sea salt and the cumin seeds. Pop into the oven for around 25 minutes, turning a couple of times. When the potatoes are starting to look a little golden place the sausages into the same pan and put back into the oven for around 20 minutes. Remove, add the asparagus and tomatoes to the pan and return to the oven for a further 15 minutes. Take out when the potatoes and sausages are nice and brown, the asparagus is slightly tender and the tomatoes are starting to pop out of their skins. Grate over the lemon zest and serve with a green salad (I added some creamy soft cheese to mine). Enjoy!